June M. Kinsey Stemple, 91, of New Philadelphia, passed away in Mercy Medical Center on Monday afternoon, August 20, 2018, due to a sudden illness. June was born in Port Washington on June 13, 1927 to the late Victor and Phemia Kinsey. In July of 1948, she married the late Herbert Stemple and raised their family based on hard work, abundant love and faith. June was a long time member of the First United Church of Christ in New Philadelphia as well as Delta Kappa Gamma and Ladies Elks Association. 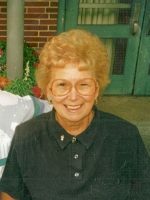 June was a very sweet, petite and unique lady who touched many lives throughout her long life, especially the many children attending elementary school at Port Washington where she taught for 40 years, ending her last years teaching the 4th grade. She enjoyed birdwatching, playing cards and her flower gardens as well as spending time with loved ones and friends. June is survived by her daughter, Jodi Hren; grandchildren, Amy, John (Naomi) and Victor (Michelle); 7 great-grandchildren, Xenia, Mie, Allyster, Bennett, Graham, Kelly and Kimberly; her brother, Floyd Kinsey; and nephew, Bill (Dana) Kinsey. June was preceded in death by her parents; her loving husband, Herb Stemple; and her son-in-law, Melvin Hren. Calling hours will be Sunday, August 26, 2018 from 1 to 4 PM in the Linn-Hert-Geib Funeral Home & Crematory at New Philadelphia. Pastors Jeff Gerber and Jill Lovett will officiate a service celebrating June’s life beginning at 4 PM. Memorial contributions in June’s memory may be directed to the First United Church of Christ, PO Box 422, New Philadelphia, OH 44663.